The Ricoh HZ15 is one of the cheapest travel-zoom cameras currently available, packing a versatile 15x zoom lens that starts at a wide-angle 24mm into a compact package that can easily be slipped into a coat pocket. The effective optical image stabilisation system and rubberised handgrip help to ensure that your pictures are sharp, while the overall build quality is surprisingly good for a camera at this price-point. Image quality from the Ricoh HZ15 isn't that great, though, with noise at low ISO speeds and aggressive processing removing finer detail, while the low-resolution LCD screen is like something from the noughties. The Manual shooting mode is a little misleading, not providing the expected photographic control, video is only 720p quality, and burst shooting is glacially slow at 0.8fps. 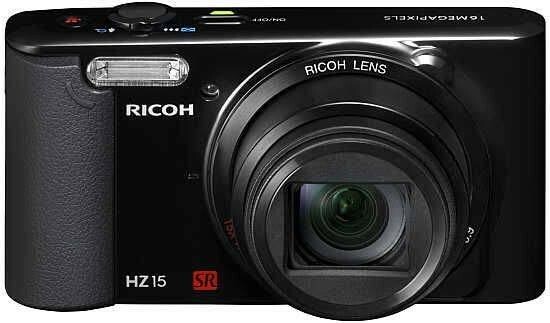 Still, the Ricoh HZ15 only costs around £120, and with its focus firmly on providing a big zoom lens in a small body, it does offer something that most of its smartphone and compact camera rivals can't offer. Despite our reservations about the image quality and the rather sparse feature set, the Ricoh HZ15 is still worth considering as a cheap and effective travel-zoom compact.